Few things can beat a well-baked bakewell tart. I've already made and blogged a bakewell tart, a few months back. But you can't have too much of a good thing, so I'm going to post a couple of recipes for variations on the bakewell tart. 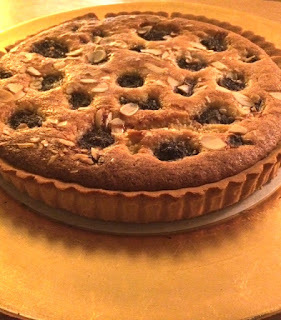 This tart I made to Mary Berry's recipe - there are enough almonds to form a proper layer on top and some water icing adds a bit of decoration. And this bakewell tart is made almost the same way, but is decorated differently - with raspberries pressed into the frangipane and a handful of almonds scattered over. First, Mary Berry's recipe. This serves about 8 people. 1. Mix the flour and salt in a bowl and cube the butter into the bowl. Rub the butter into the flour with your fingertips until it resembles breadcrumbs. 3. Mix the cold water into the crumble mixture little by little until it comes together into a ball when kneaded together - you may not have to use all of it. Wrap in clingfilm and refrigerate for at least half an hour. Preheat the oven to 200C towards the end of this time. 4. Make the filling in the meantime, melting the butter and then removing from the heat and adding the sugar. Add the eggs and flour at the same time and beat to combine - the flour will stop the mixture from curdling. Beat in the ground almonds and baking powder. 6. Line the tin with baking paper or foil and fill with baking beans, dried pulses or rice to weigh it down. Then bake for 15 minutes, removing the paper and whatever you used to weigh it down 2 minutes before the end of the baking time. 7. Spread the jam across the base of the pastry case, then spoon the frangipane on top and smooth it out with the back of a spoon. Add the flaked almonds and bake for 25 minutes until well risen and golden, adding the flaked almonds on top after 20 minutes - if you think the almonds are browning too much, put foil over the top. 8. While the tart is cooling, mix together the water and icing sugar for the icing. When the tart has cooled, pipe or drizzle it over the top in a zigzag pattern. Now for the raspberry topped tart. 1. Follow the first recipe up to the end of step 6. 2. Spread the jam across the base of the pastry case, then spoon the frangipane on top and smooth it out with the back of a spoon. Space out the raspberries and press gently down on each one so it sinks into the frangipane a little. 3. Scatter the almonds over and bake for 25 minutes until well risen and golden, covering with foil if you think the filling is browning too much. 4. Serve! Maybe with cream. There, bakewell tarts. Baked well.